We’ve never seen a villa with its own pitch and putt golf range before and thought it was a tremendous addition for family fun or for allowing golfers to iron out glitches before parting with the huge green fees for the 18-hole course New Kuta Golf Club (34km). We loved the fact that nearly all the rooms in the villa are on one level, making it very social, accessible and appropriate for all ages. And all of the bedrooms (with the exception of the lower studio room - which is slightly smaller - but very private) are very similar and won't be the cause of any group envy. We lazed away the latter part of the day on comfy couches shaded by the funky bamboo roof of the elevated open-air living and dining deck by the pool. From here we observed the farmers ploughing and flooding the rice terraces in preparation for planting. The staff were diligently on hand with offers of snacks and drink refills to refresh us throughout these exhausting people-watching activities. At sunset we retired for a splendid Indonesian dinner in the main hall. It’s hard to imagine a more perfect villa for families with older children, groups of friends or business partners, plenty of space and opportunity to enjoy meals and shared social times whilst being able to retreat to a terrace or garden daybed to read a book or enjoy a massage. You won’t be falling over each other on this manicured estate. Maridadi is also a spectacular backdrop for weddings, dinner parties, barbecues or sunset cocktails. Highly recommended is an evening cultural dance and music performance arranged by the villa staff, who can also prepare the famous Balinese Babi Guling (roast suckling pig) to make it an authentic Bali evening. We particularly enjoyed long beach walks with ever-changing views – from wonderful villages with traditional outrigger fishing boats to stunning rice terraces, surfers and ceremonies. There is nothing nicer than returning from a long walk or bike ride to a pre-arranged massage or treatment selected from a menu at the villa (extra charge). Children of all ages invariably end up turning the front lawn into a football, rugby or cricket pitch and will find a variety of picnic spots, like the wooden rice barn, to add to their holiday fun. The villa is a little off the beaten track with the nearest restaurants and shops 12 -14km away however with such a varied and expertly executed menu, and staff who will venture forth to purchase anything you wish for, we found this was of little consequence. If you do want to get out and about, the villa comes with a car and driver (petrol is charged). When you have morning views over rice terraces and volcanoes, sunsets over sea temples and breaking surf, sublime comfort, superb cuisine and pampering staff there’s not much else to wish for. Even though you’re almost on the fairway of one of Asia’s best golf courses, you don’t have to be a golfer to enjoy a stay at this villa. 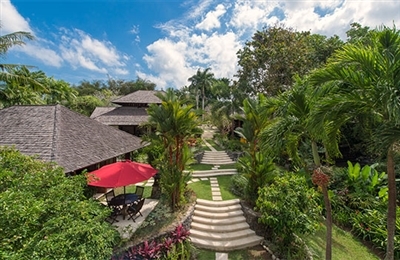 Private homes with beachfront locations are not in abundance on Bali’s south-west coast, which makes Ocean and Golf a particularly good find as well as being good value. There are few better spots to enjoy the famous Bali sunsets than from this villa’s breezy balcony. Ocean and Golf incorporates the best of both worlds; a quiet and private residence which, for an additional daily fee per person, also has access to leisure facilities at the neighbouring 5-star resort – you can even order room service (although you do have your own cook who prepare meals from a suggestion menu charging only the cost of ingredients plus 20% service charge). 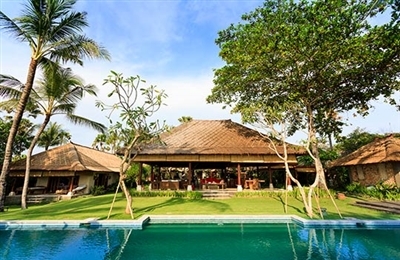 However for guests who want to venture out to experience the shopping, restaurants and nightlife in town, this villa is a little remote (Seminyak, the popular entertainment hub, lies 23km south). We enjoyed walking around the sprawling grounds and whizzing from the villa to the hotel lobby in our golf buggy. The view of Tanah Lot temple from Cendana, one of the award-winning restaurants at the Pan Pacific Nirwana Bali resort, is magnificent – especially at sunset. Ocean and Golf is an ideal base for a group of golfers or a golfer who wants to bring the family along. It is sensible for seniors – there are two downstairs bedrooms if steps are difficult to navigate. Whilst there is a twin bedroom for children upstairs and plenty of TV’s to go around. As long as they don’t wander onto the fairway, it is a very safe environment for kids, and the complimentary facilities at the Pan Pacific Nirwana Bali resort will keep children busy for weeks. 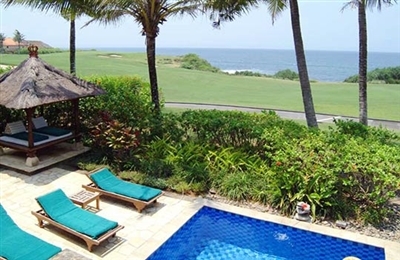 If you are going on a golf holiday – and let’s face it you can’t beat the double win combination of not only Bali, but one of the best courses in Asia – living on site is such a privilege. 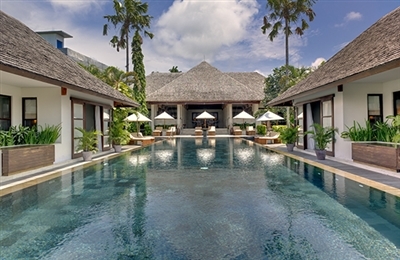 The great thing about Villa Arjuna is that when you hole out on 18 in the humid tropical heat it’s only a five-minute drive back to the villa where lunch, cold beers, and a cool swimming pool await you. There are no swimming beaches or independent fine-dining restaurants in the immediate vicinity, but the Nirwana Bali Golf Resort is a five-star facility with plenty of contemporary dining options including a fine-dining restaurant of its own. A spa and health club, tennis courts and a kids’ club are just some of the other attractions for families. Best of all, the giant resort pool with 54m hydro-slide is perfect for keeping the kids amused all day long (extra charges apply for use of resort facilities – see rates page). Players therefore shouldn’t feel at all guilty about turning their better halves and quarters into golf widows and orphans…they just won’t care! 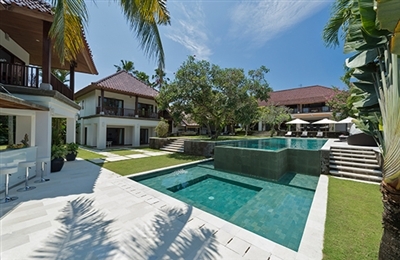 Villa Senja is not a swanky hi-tech villa, but this is reflected in the price, which is especially good when you take into account the discounts that you are going to get on your golf rates. This is the original luxury Bali style; commonly found in villas and hotels that were built in the ‘90s.Things move fast in Bali, especially in the field of design, so the style looks a bit dated these days, and is sometimes referred to as ‘Bali for beginners’. Nevertheless, the architecture, thatched roofs, local stonework, interior design and furnishings remain both charming and very tropical. There are numerous benefits to being linked to the resort; apart from all the aforementioned facilities, there is an on-site generator (so you won’t get any of the power cuts, which are unfortunately rather common in Bali) and the water pressure in the showers is great (again, this is something that can sometimes be a bit hit and miss in Bali). The villa is a long way from the delicatessens of Seminyak (18km), so if you want meals created with gourmet ingredients you will need to let the staff know well in advance. Local specialties with fresh local ingredients are therefore the cook’s forte, and you can always enjoy fine dining at the resort.